The Crown Colony of North Borneo was a British Crown colony established in 1946 shortly after the dissolution of British Military Administration. The Governor of British Crown Colony of North Borneo (Malay: Tuan Yang Terutama Gabenor Koloni Mahkota British Borneo Utara) is the position created by the British Government upon the cession of North Borneo from the North Borneo Chartered Company. The appointment was made by King George VI, and later Queen Elizabeth II until the self-government of North Borneo on 31 August 1963 and the forming of the Federation of Malaysia on 1963. After the formation of Malaysia, the title was changed to 'Tuan Yang Terutama Yang di-Pertua Negeri Sabah', which also means 'His Excellency The Governor of Sabah', or 'His Excellency The Head of State of Sabah' and the appointment was later made by the Yang di-Pertuan Agong or King of Malaysia. Labuan joined the Crown Colony on 15 July 1946. ^ Anthony Kirk-Greene (12 June 1999). On Crown Service: A History of HM Colonial and Overseas Civil Services, 1837-1997. I.B.Tauris. pp. 183–. ISBN 978-1-86064-260-9. 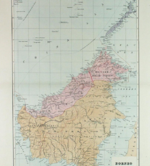 ^ "The National Archives DO 169/254 (Constitutional issues in respect of North Borneo and Sarawak on joining the federation)". The National Archives. 1961–1963. Retrieved 23 April 2015. ^ Philip Mathews (28 February 2014). Chronicle of Malaysia: Fifty Years of Headline News, 1963-2013. Editions Didier Millet. pp. 15–. ISBN 978-967-10617-4-9. ^ Frans Welman. Borneo Trilogy Volume 1: Sabah. Booksmango. pp. 159–. ISBN 978-616-245-078-5. This Sabah-related article is a stub. You can help Wikipedia by expanding it. This page was last modified on 6 October 2015, at 22:34.